" Island Bound" is a custom-built Chesapeake deadrise style hull built by Chesapeake Boats of Crisfield, MD. She is the fastest inspected vessel on the NH seacoast and is powered by twin 2005 Cummins 660 HP QSM series engines . These engines meet the new stringent EPA guidelines for emissions and have no diesel exhaust smell when underway or at idle. Onboard electronics employ the latest state of the art technology. Inside the cabin she has ample seating, heat, enclosed head (bathroom) and bunks below to provide a comfortable environment . "Island Bound" is also equpped with hi-def satellite TV, satellite radio, i-Pod, and CD and DVD players for maximum enjoyment! 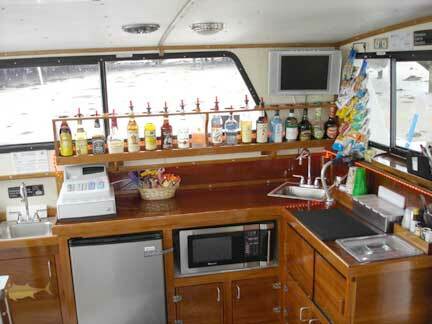 A full bar, beer, soda, and snacks are available. 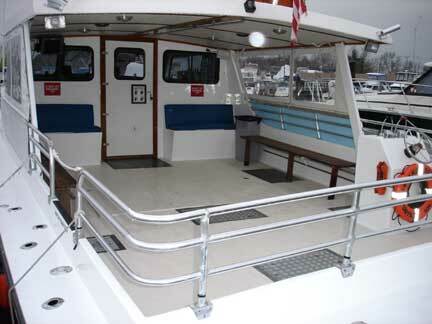 Our oversize deck gives ample room for all fishing activities.